For years, scientists have known that Mars has ice locked away within its rusty exterior. More elusive, though, is figuring out how much of that water is actually sloshing around in liquid form. Now, NASA scientists have found compelling evidence that liquid water—life-giving, gloriously wet H 20—exists on Mars. We’re not talking gushing rivers or oceans here. These scientists have been investigating “recurring slope lineae,” patches of precipitated salt that appear to dribble down Mars’ steep slopes like tears rolling gently down a cheek. Planetary scientists hypothesized that the streaky formations were products of the flow of water, but they didn’t have concrete, mineralogical evidence for that idea until now, says Lujendra Ojha, a scientist at Georgia Tech who first spotted the lineae back in 2010. In a new Nature Geoscience paper, published online today, Ojha and his colleagues present “smoking gun validation” that it was liquid water flowing on Mars’ surface that formed these tear stains. Ojha and his team have watched these lineae form every Martian summer, growing wider week after week until they slowly fade come winter—exactly the times and places where conditions are right for liquid water to exist on Mars. Plus, the surface is crusted with salt, which could help stabilize liquid water so it doesn’t boil or freeze. Ojha notes that they haven’t actually observed water flowing on Mars. The team took their data from the CRISM instrument on the Mars Reconnaisance Orbiter, which, frustratingly, only observes the surface every day at 3 pm. That’s when Mars is at its hottest and driest, so any liquid water oozing on the surface would have long since evaporated by the time MRO laid eyes on it. Still, the water left a distinctive chemical trace. 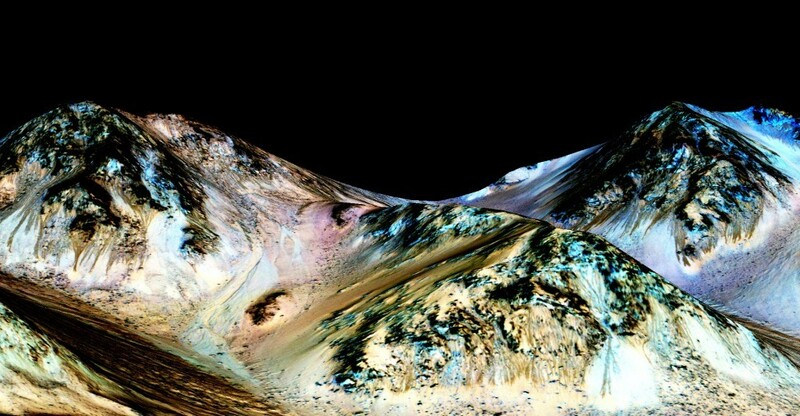 “Whatever is flowing on Mars is hydrating the salt,” Ojha says, “and we’re seeing that hydration in the spectral signature.” After extracting spectral information from pixels of the CRISM instrument’s data, Ojha and his team determined that the salts—magnesium perchlorate, magnesium chlorate, and sodium perchlorate—had water molecules interspersed in their crystal structures. That’s pretty strong evidence that they were deposited by flowing water. The team doesn’t know where the water is coming from, or how much of it there is yet. “That’s the big mystery right now,” Ojha says. They have ideas, though: Maybe the ice inside Mars is melting and percolating out, or maybe a subterranean network of aquifers is feeding water to the surface. Right now, NASA’s favorite explanation is deliquescence, in which the salts grab moisture from Mars’ atmosphere to create liquid water. Either way, this is exciting evidence that Mars could potentially support life—including human life, if Earthlings ever figure out how to colonize the place. NASA is already thinking up potential uses for the water in a future settlement: Scientists could use the hydrogen and oxygen in H2O to make rocket fuel, or water plants in greenhouses, or keep colonists hydrated (important). “The resources are there,” says John Grunsfeld, a science mission administrator at NASA. Plus, now that they know Mars has liquid water, scientists can narrow down the best places to look for life and direct their next rover, scheduled for 2020, to collect samples at those places. Which, in the long term, will get scientists closer to finally figuring out if life exists on other planets. This story has been updated to include information from a NASA press conference.